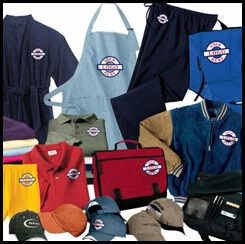 We screen print on hundreds of items from T-shirts to sweats, duffle bags to cooler bags and much much more. We have low minimum requirements for screen printing AND NEVER CHARGE for screens or artwork on our T-Shirts or Sweats. Once we receive your design, the artwork is separated by color, and placed onto film positives. Each film positive is then transferred onto one screen. This is a simple process of matching a garment style and color to fit your design and budget. Our experts are available and happy to assist you in determining the best garment for your design.